This liquid water causes diameter lossed and causes diametter losses and rusting in the air installation, damages in pneumatic systems and besides several problems that trigger eachother. These damages that cause loss of work, time and Money in the processes are prevented by discharging liquid water occuring in cooling of compressed air (+3 dew point temp.) 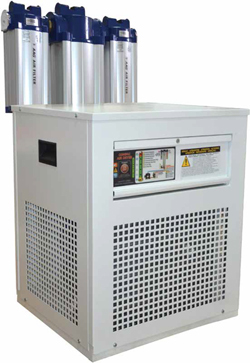 by refrigerated air dryer.